I have not been in a kapa since before my eldest child was born and I have never been in a serious kapa. In part that is a matter of the time that is available with young children, but it is also because I am not particularly good. I seem to struggle to retain words, I get actions mixed up, and my timing is not great. In addition, my cousins just look so intimidating, I suspect I would only bring a comedic factor to their lines. I will also admit that I have an underlying streak in me that if I am not any good, than why bother? But tomorrow, 29 April 2014, I will be one of possibly 600 men, women and children who will stand in support of our ope tū taua at the haka pōwhiri to mark 150 years since the battle of Pukehinahina, or Gate Pā if you prefer. I am going to don a blanket, do a bit of period cosplay and haka a few rows back from the best of them. 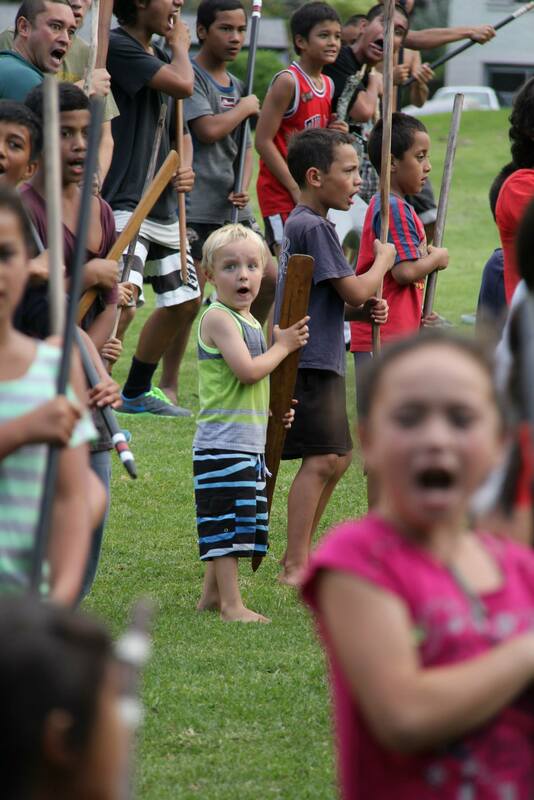 Now there is safety in numbers and as preparations have built the whole event has a bit of a feeling around it that you will want to be able to tell your mokopuna that you were there. Also, I have three children, Ms 11, Ms 8 and Mr 5 who are all going to be there too. Tarewa, daughter of Maungapohatu, Tahatika, her husband and their two sons, Te Pohoi and Karanama: four of my direct ancestors fought at Pukehinahina. The vague sense of connection I had as part of Tauranga Moana has firmed into an awareness that I am an heir of the mana and tapu of their actions on that day. They fought in the hope that I would have a better future through their sacrifices. I will stand tomorrow in an ecstasy of ihi and wana during our three haka/peruperu as an avenue to express my rage for my losses, for our losses due to raupatu. Te Pohoi was at the Māori Land Court hearing as an old man; he could barely hear, nor see. He died 14 years later after dictating his memoirs. He was there, this tūpuna of immense memory, recognised mana and deep knowledge like a beggar with his hat out, asking a court created by a colonising government to recognise that he had interests in Whakamarama. It is difficult to express how ludicrous the situation was; he could articulate whakapapa links to the whenua that were ancient and sacred, but was throwing pearls amongst swine. My particular family line have no whenua in the Pirirākau territories. After raupatu, after the return of our tūpuna in impoverishment and loss at the surrender of our Māori king, after the miserly and fraught reallocation of land through the Māori Land Court, my great uncle added insult to injury by selling off our remaining whenua and fleeing to Australia. We are landless here. We rely on the good graces and aroha of our whānau karanga to keep our ahi kaa burning. So tomorrow it is only appropriate that I will hold a borrowed taiaha; sometimes I feel like a Māori version of Game of Thrones’ Beggar King. Yet I will hold the taiaha with strength, greeted by my cousins with laughter, smiles and twinkling eyes, and we will be strong togther. Tomorrow we will be the kore tuohu, the undefeated. Unbowed, we will welcome our king and our whanaunga from many iwi. We will intimidate the Governor General, the representatives of the original British regiments and curious Tauranga residents with our kaha, our ihi, our wana, our mana. From the mana of those warriors of old, I know that I am the best that my ancestors could hope for: I am well educated, I am healthy, I am happily married, I know my reo Māori, my tikanga, I am an active supporter of my marae, my hapu and my iwi, and both I and my children have not forgotten what they fought for. Tomorrow I will stand because of the words spoken by Te Pohoi Tahatika in 1901 that can be summarised as this: “Remember.” Finally though, I will stand because of my dream for my tamariki and mokopuna, that in time, they too will stand as warriors, as rangatira, as leaders on their whenua. Te Kaponga Cameron on Pukehinahina, aged 5, sixth generation descendent of Te Pohoi Tahatika, a proud member of Pirirākau. This post from you blew me away. Anei ra te mihi. I have a taiaha that was gifted to me by inmates at Te Whare Tirohanga Maori (Hawkes Bay Prison Maori Focus Unit) when I left Corrections in 2008. I have never felt worthy of taking it up myself but I have a mokopuna who has been promised it when he has developed the appropriate skills. I note that you are using a borrowed taiaha tomorrow but just letting you know that I will have mine with me tomorrow morning should you wish to use it or if you know of someone who does not have a taiaha for tomorrow. Of all of the occasions when it should be brought into use, tomorrow rates highest based on your post. Kei te mihi ki a koe, e te rangatira. Kāore he kupu ki tēnei koha. Māku tōu taiaha e mau, nōu te mana i whiwhi. Kia ora ki a koe! That is my son, and it’ll be an amazing privilege for all of us to be with everyone on the day. Ki a koe hoki, e hoa. Kāore e warewaretia te rā Pukehinahina.